"Sarah Sheppard takes dinosaur fans very seriously and serves up solid facts in a very accessible and delightfully vivid manner. 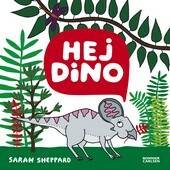 A great little dinosaur drama in board book form by Sarah Sheppard. Fascinating dinosaur reading in a leafy jungle for the youngest children. If you want to know more about the dinosaurs in this picture book, read the books that the critics have acclaimed: Masses of dinosaurs, Beware of the meat gang, Dino ABC and Dino 1-2-3.